The study of protein dynamics is essential for understanding the multi-molecular complexes at subcellular levels. Fluorescent Protein (XFP)-tagging and time-lapse fluorescence microscopy enable to observe molecular dynamics and interactions in live cells, unraveling the live states of the matter. Original image analysis methods are then required to process challenging 2D or 3D image sequences. Recently, tracking methods that estimate the whole trajectories of moving objects have been successfully developed. In this paper, we address rather the detection of meaningful events in spatio-temporal fluorescence image sequences, such as apparent stable “stocking areas” involved in membrane transport. We propose an original patch-based Markov modeling to detect spatial irregularities in fluorescence images with low false alarm rates. This approach has been developed for real image sequences of cells expressing XFP-tagged Rab proteins, known to regulate membrane trafficking. 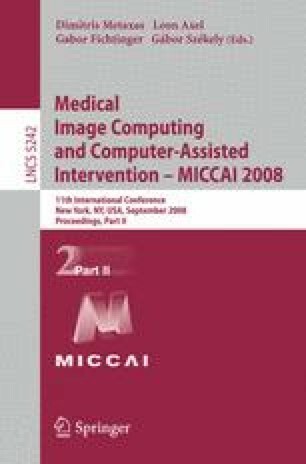 Electronic supplementary material is available for this chapter ( 10.1007/978-3-540-85990-1_12).